As many of you know, I'm fairly aggressive when it comes to marketing my book. After all, a prestige format, niche market item like Classic Home Video Games 1972-1984 needs all the exposure it can get. But I also routinely promote classic gaming endeavours by other folks, including books (Steven L. Kent's Ultimate History of Video Games), websites (Digital Press, Atari Age), and stores (Movie Trading Company, Game Over Video Games). This time out I'd like to put the focus on 2600 Connection, the labor-of-love fanzine started by Tim Duarte and currently published by Al Backiel. 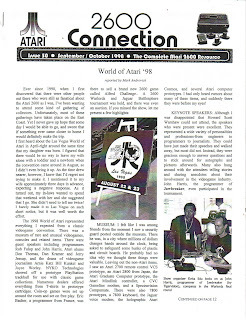 The breezy, fun-to-read mag began in the Summer of 1990, when Atari was still releasing games for the Atari 2600. The first issue was a mere two pages in length (front and back on one piece of paper), but the publication has evolved to include much more content, including photos. Currently, circulation for the 2600 Connection is just under 100 copies, but it deserves a much wider audience. In addition to subscribing to the 2600 Connection (issue #91 is now available), you can purchase the first 50 issues directly from Tim Duarte. For more info, check out the 2600 Connection website. You'll be glad you did. There were 2600 games released by Atari in 1990?!? I thought they were still doing the 7800 and had been about to put out the Jaguar at that time. The 2600 Connection was a fantastic little 'zine and I was proud to be a part of it (since ish #2).